If you haven't noticed, I like making things. Simple things. Easy things. I admire those that can spend hours on a just the right stitch, or those that do things over and over again just to get it right. I'm trying to work up to that...but let's be honest, I'm so not there. 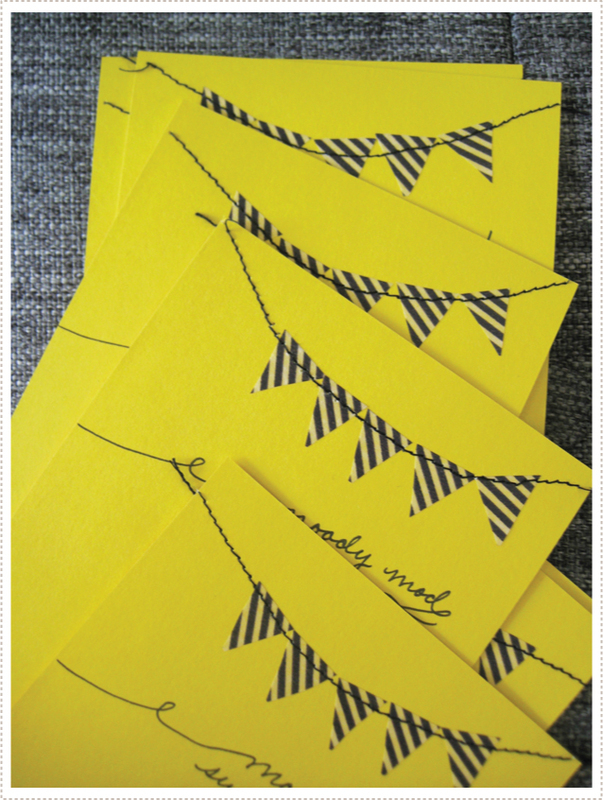 That is why I love little bit projects like these super easy pennant tea party invites. I made these by simply cutting decorative tape into triangles and a then sewing a stitch across the top. Add a little hand written note, and voila! you are done. Now that is my kind of afternoon project. and beautiful! i love it. suuuuuuper fantastic! love the pennants out of happy tape! This looks simple and amazing. My kind of project! wonderful! what a great idea! i likey. i'm with you on the easy peezy front. two kids doesn't leave a whole lot of time to labor over a stitch...even if we wanted to. absolutely gorgeous. your handwriting is so sweet! Wow- these are simply lovely! Where did you find such great tape? wow. thank you for this! they are just perfect. That is really beautiful and so simple. What a wonderful little project! Thanks for sharing and have a lovely merry happy day! Love to you! This is a awesome idea! 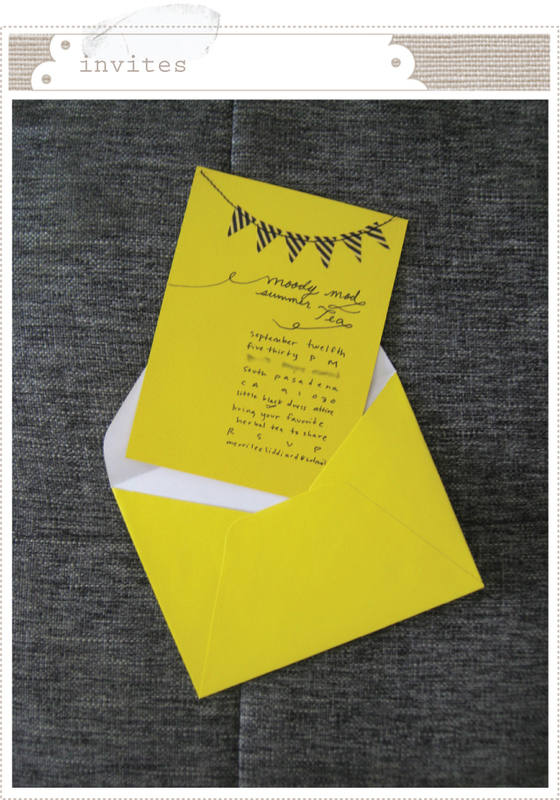 Simple AND gorgeous invites! Very, very cute. Love it! GORGEOUS! So creative...I just posted about my own DIY 'save the dates' on my blog, check them out. Very beautiful. Your blog is lovely. 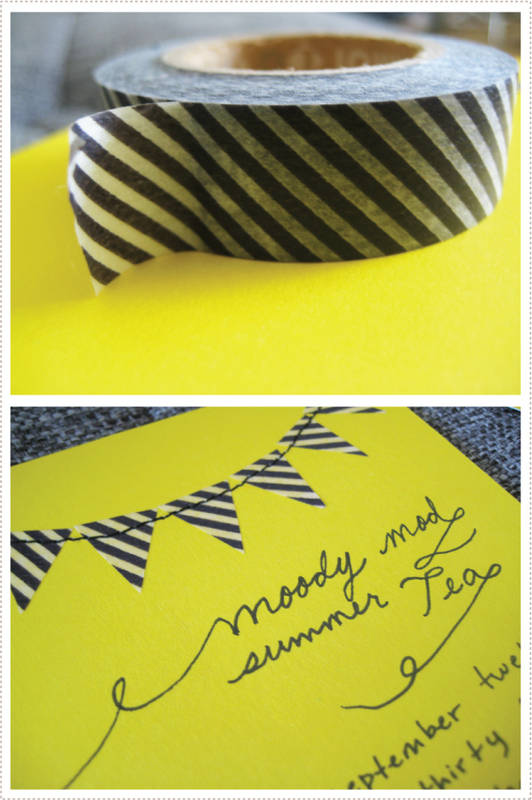 I adore that striped tape - so fun. Must indulge. Thanks for sharing such a fabulous creation. These invites are so beautiful and creative and your tea party looked like it was alot of fun. These are so cute, I hope you don't mind, I had to share them on my blog today. Couldn't you just see me spending hours on something this easy! What am I saying you have seen me spend hours on something this easy. These days when I find myself getting hung up on the details I simply say Merilee would let it go! I love the tea party. Inspiring as always. i made such similar ones in august for a birthday party. love flag garlands and love this color palette! I love this. I posted it on my blog and linked it back to you. I admire people like that too. That try and try until they get it right.